Opinions of an anonymous youth! 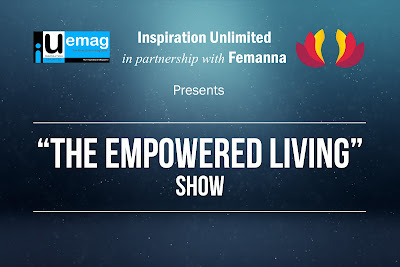 Empowered Living SHOW: Empowering People Globally! Today's world scenario poses new challenges every day. You just fight one, win another & there's one more right there looking straight into your face & making you feel totally stressed & defeated. The number of vast angles to balance in life to believe you are living a balanced life have seemed to increased & they stress us out even further. The challenges are even more for women entrepreneurs & more so with changing times & increasing competition besides growing responsibilities. In such a scenario Inspiration Unlimited e-magazine in collaboration with Lisa Meisels, Founder of Femanna, have launched the Empowered Living SHOW to bring real time advice from those living a balanced life along with great career success. This show invites women entrepreneurs as guests who seemed to have fairly accomplished their journey and made successes for themselves that others wish for but haven't. They share their strategies to tackle the day to day challenges that bog one down totally. This show is hosted by Lisa Meisels, who is a best-selling author, speaker, dietitian-nutritionist, Founder of Femanna and creator of Recharge Your Business Mojo. Her experience as a Registered Dietitian Nutritionist, Holistic Life Coach, and LEAP Therapist, as well as her online business and broadcasting experience, allow her to offer clients a unique combination of expertise and resources that can help them stand out, get seen and become a client magnet! Lisa has spent nearly 30 years as an expert in food and nutrition, training, mentoring and process development. She was the Director of Nutrition Services for a multi-million-dollar company managing multiple teams over 5 states. Over the last few years, she has become skilled in online business, marketing and broadcasting. Lisa's clients get results. They say that she is a dedicated business coach who takes the time to bring out the best in each person and help them find solutions so they can move their business forward. At Inspiration Unlimited e-magazine we are happy to partner & produce a show like this for our readers globally to scale the spell of Unlimited Inspiration we could possibly cast via this medium. Watch, Share & Learn from this Empowered Living SHOW & we hope you would have an Empowered life. For queries around this SHOW, recommending of guests or feedback to improve comment your thoughts below or send an email to iuemagazine@gmail.com / contact@iuemag.com. The Ongoing Cyberattacks on Indian companies! It is a matter of concern not only for Government Agencies but we as public, as well. Many private telecom companies jeopardizing customers' data for the sake of cost cutting by using cheap Chinese equipments, that too by violating Government Guidelines. The ongoing panworld Cyberattacks is not just a recent but a serious threat to citizens of every nation, particularly country like India with millions of internet users unaware and unconcerned about such threats. An urgent cyber security audit of many tech companies is the need of an hour. The recent India-Israel bonhomie raises concern over India's time-tested diplomatic relations with West Asian Countries and Nehru's NAM commandments. In lieu of cheering Israel and America, India not only loosening the thread of trust and sympathy with Iran, Palestine and other Arab countries but also degrading our relationships with China and Russia. It is high time to check and correct our diplomatic course which is designed and developed by others but not the career diplomats, at New Delhi's think-thank(s). Read and Revised. The past few edition(s) were better than this one. As they were more exhaustive and comprehensive. It's a very first time I've read this book on Kindle Paperwhite. So definitely, I'm gonna share all those important highlights and notes with my readers on my Goodreads profile. So what's new in it? Well, you should ask what's less in it? As more than half of Defence chapter is deleted without any information about advanced and recently developed weapons of mass destruction. Plus, there's very minuscule coverage of Health, Child and Women Welfare schemes which are in abundance in Modi era. Earlier, prior to 2012, we can download this book free of cost from Publication Divison's website. But when Congress made Manish Tiwari IandB Minister, he stopped the availability the of the PDF version of this book. So whether I should recommend you this book or not? Daniel Pink just nailed it. Now he too comes in my favourite authors' list. It has been more than a year since I've been seeing and hearing about his book Drive. And, finally, I got a chance to read and review for you...! As the title Drive: The Surprising Truth About What Motivates Us suggests, it's something about a hidden force among us which makes us do whatever we're doing. Basically, he has classified & discussed Motivation in 3 categories, along with their history & relevance. What I liked most is the elaborated examples of some fabulous companies with their innovative work methodologies ie Zappos, Meddius, Google and others. Rewards and sanctions are effective on a short-term basis as performance incentives. In the long run, however, they lead to harmful behaviour and destroy the inner impetus. Passion and dedication on the part of workers are better achieved through self-determination, possibilities for perfection and meaningful goals. What types of motivation are there, and how do they work? Motivation 1.0 and Motivation 2.0: basic needs and the stick and the carrot. There is another way: Motivation 3.0 – intrinsic motivation in place of exterior incentives. Missing the target: the stick and the carrot can have harmful consequences. How does intrinsic motivation work, and what influences it? Extrinsic promises destroy intrinsic motivation. Get into the flow: the inner drive for perfection leads to passion and dedication. The pursuit of meaningfulness: a fundamental inner impetus. How can intrinsic motivation be increased in everyday work? My task, my time, my team! Self-determination promotes intrinsic motivation. The effective company: upgrading to 3.0. Verdict - Don't waste your time any further, buy this book http://amzn.to/2nG1gvQ and start reading! Here's the link for the best price available. Though I didn't gain anything new from this book (audio book in this case) but it doesn't mean I didn't liked it. This is good for someone who didn't know anything about Mindfulness, informal or formal which the author Jon Kabat-Zinn has categorised in his book. Here's short summary & I don't recommend you to buy this book but at least go through the highlights & notes I've made & posted on my profile. As it'll be very helpful in your quest for peace & happiness. Particularly, the anecdote of H. H. Dalai Lama. By being constantly on the move and cramming a crazy amount of activities into our daily schedules, we’re losing our ability to fully enjoy the present moment. Our minds are constantly focused on the past or the future, and we’re forgetting that the only time we really have is now. Fully appreciating the present is a matter of pausing and bringing our attention to it. Help others and yourself by using and extending your heart-centered presence. First, centre yourself and, from your heart or your belly, invite feelings of kindness, love and acceptance into your body. Let these feelings grow until they fill your whole being. Once you feel them radiating within you, you can stay in the moment and relish it, or direct these feelings outward to wherever or whoever you please – be it your family or even people you don’t know. Picture them, honour them and wish them love and acceptance. Though I've read this book quite fast but I really enjoyed those useful lessons and somehow in mid of it, I started considering myself as a good psychopath. Someone who has total control on fear or any emotion, whatsoever. And, it maybe due to years of mediation & reading spiritual scriptures. Some psychopaths end up in jail as tried murderers and rapists, but others are successful executives, lawyers and surgeons and hold high political offices. Actually, it’s specific psychopathic traits like fearlessness and living in the now that help them achieve success – a lesson for anyone who wants to learn from successful, functional psychopaths. What makes psychopaths different from others? What are they like? Psychopaths are often charming and intelligent – and know no fears. Psychopaths make decisions coolly and rationally; emotions and morals aren’t factors. Psychopaths don’t just contemplate doing something – they take action. Why are psychopaths successful? What sorts of positions are best for them? Some psychopathic traits are more common in executives and politicians than in convicted criminals. Living in the here and now – what psychopaths have in common with Zen masters. Psychopathic traits are especially useful in stressful, chaotic environments. “Generation Me”: Psychopathic traits are more widespread in younger generations. What can we learn from successful psychopaths? Acquiring psychopathic traits can be useful for your own advancement. Functional psychopaths can flip their behavioral switch depending on the situation. I opine... by Sumeet Mahendra is licensed under a Creative Commons Attribution-NonCommercial 4.0 International License. Based on a work at www.sumt7.blogspot.com. Permissions beyond the scope of this license may be available at www.twitter.com/sumt7.